Jerry D. Goins, age 71, of Knoxville, passed away Friday, October 19, 2018 at Park West Medical Center following an extended battle with respiratory illness. As a child, he grew up in the Claxton Community in Anderson County where he attended Edgemoor Baptist Church. Jerry graduated from Clinton High School in 1966 where he played trumpet in the CHS Band. After graduation, Jerry joined the U. S. Air Force serving his country from 1966 - 1970. He was stationed at Seward Air Force Base, Smyrna, TN, Clark Air Force Base in the Philippines, and in Vietnam. He was a Vietnam Veteran. While stationed at Seward in Smyrna, Jerry met the love of his life, Brenda. They were married in 1970 and the couple have two daughters, Stacey and Chanda. Jerry’s career field was industrial maintenance. He retired from Gerdau Ameristeel at age 60 due to respiratory illness after 20 years of service. Jerry was preceded in death by his parents L. S. Goins and Flossie Goins and also his twin brother, Gary Goins. He leaves to cherish his memory his beloved wife of 48 years Brenda, two children Stacey and Chanda, grandchildren Logan Jackson, Kristina Jackson Knight, Melissa Hensley and her sons,Levi and Collin and one great-grandson Blu Knight, one sister Jan and her husband Ed Hall and their son, Blake. He will also be missed by his little dog, a Shih Tzu named Maddie. The family will receive friends Saturday, October 27, 2018 from 11:30 AM until 1:30 PM at Weatherford Mortuary, Oak Ridge, with the funeral service to follow at 1:30 PM. Rev. Doyle Wolfenbarger will be officiating. The burial will follow with military honors at Woodhaven Memorial Gardens, Edgemoor Rd, in the Claxton community. The family thanks the staff of Statcare Pulmonary Group and the step down unit of Park West Medical Center for their exceptional compassionate care during Jerry's extended battle with respiratory illness. To send flowers or a remembrance gift to the family of Jerry D. Goins, please visit our Tribute Store. 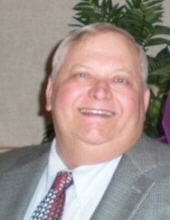 "Email Address" would like to share the life celebration of Jerry D. Goins. Click on the "link" to go to share a favorite memory or leave a condolence message for the family.